Home > Resources > Lifestyle Tips > What’s Your Zone Personality? 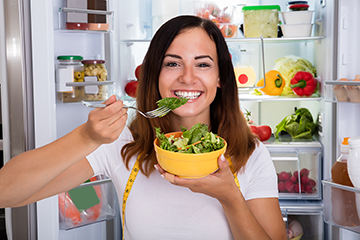 There are many ways to follow the Zone Diet and each of them will get you to the same place, it’s just a matter of how much time you want to spend and how precise you want to be. No matter which approach you choose, a perfectly balanced Zone meal should control hunger and fatigue for 4-5 hours. 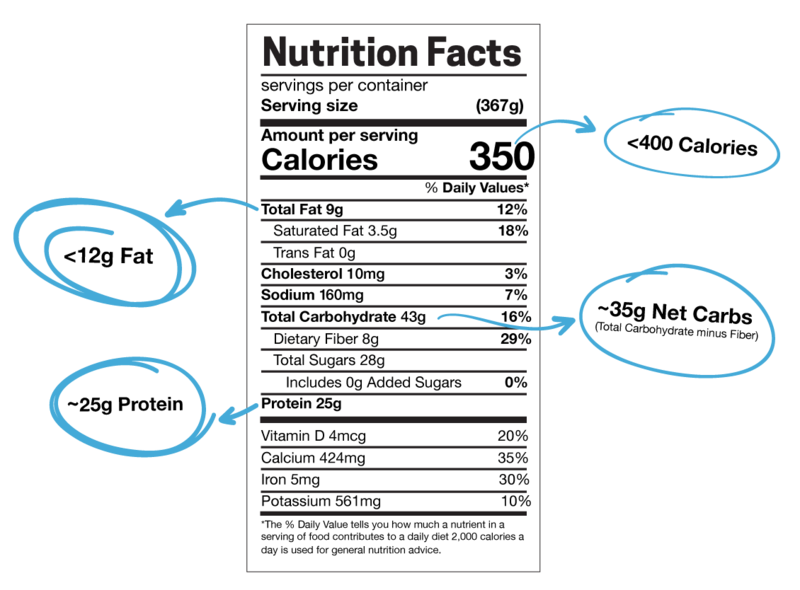 Calorie-wise a Zone meal is about 40% calories from low-glycemic carbohydrates, 30% calories from lean protein, and 30% calories from heart-healthy fat. It might take a little practice to perfect, but there’s no guilt in the Zone, just continue adjusting until you reach what works for you. Find out where you fit. If you’re an athlete, have a defined health goal, or someone who likes to be as precise as possible, counting your macros (protein, carbs and fat) with Zone Food Blocks is the most precise way to get to the Zone. Use this simple calculator to get your numbers. 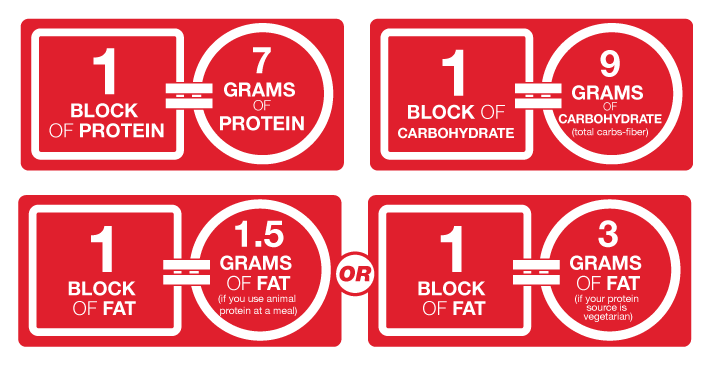 What It Looks Like: A Zone Food Block is simply a measurement we use to define how much protein, carbohydrate and fat you should be eating. This makes it easier to calculate your meals. The average female would consume about 3 blocks of each macronutrient at a meal (21 grams of protein, 27 grams of carbs, 4.5-9 grams of fat) and the average male about 4 blocks of each at meal (28 grams of protein, 36 grams of carbs, 6-12 grams fat). Use our food block guide to start putting meals and snacks together based on your individual needs. If you don’t want to spend too much time calculating, or prefer to use an app (e.g. MyFitness Pal, LoseIt, FitDay) to log your macros, you can use food labels or tally the totals from each meal to gauge whether you’re in the Zone. How It Works: Use this rule of thumb: A Zone meal should contain no more than 400 total calories to help stabilize blood sugar and minimize inflammation in the body, at least 25 grams of lean protein, less than 12 grams of heart-healthy fat, and about 35 grams of net carbs (total carbohydrate minus fiber). The carbohydrates you choose should come primarily from low-glycemic choices like those in non-starchy vegetables. The easiest but least precise way to follow the Zone Diet is using the Hand-Eye Method. How It Works: Using this method you simply divide your plate into three equal sections. On one-third of the plate you put low-fat protein about the size and thickness of the palm of your hand. The other two-thirds should be filled with colorful carbohydrates, primarily non-starchy vegetables with limited fruits. Finally add a drizzle/dash of monounsaturated fat (olive oil, nuts, avocado) to complete the meal. The hand-eye method becomes very helpful when you're at a buffet, eating in restaurants, having a catered work lunch, or going to a get-together with friends. We always recommend starting with the Zone Diet as your foundation, but if you only have 2 seconds in your day to devote to your health then give yourself the best anti-inflammatory defense with OmegaRx 2 and MaquiRx. OmegaRx 2, an omega-3 fish oil supplement rich in EPA and DHA, supplies one of the highest concentrations of omega-3s (75%) available in the consumer marketplace. MaquiRx, a polyphenol supplement, acts as an antioxidant to help combat inflammation and promotes improved immunity through supporting the activation of key genes. Let us know in the comments below which personality type you are!